Video has emerged online of the arrest of the suspects wanted in connection with the death of a Baltimore County police officer in Perry Hall. 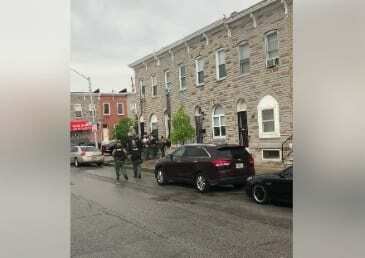 In a Facebook video being circulated around the internet, police can be seen swarming a home near the intersection of Ashland Avenue at N. Montford Avenue in Baltimore City (21205). A suspect is taken into custody and police then enter the home. Officer Amy Caprio was killed on Monday afternoon after investigating a suspicious vehicle on Linwen Way in Perry Hall. Authorities believe the 29-year-old officer may have been run over by the suspects’ vehicle. All four suspects wanted in connection with the case are now in police custody. You can view video of the arrest below.